With Germany's Election Around The Corner, What's Putin's Play? Russia has been less aggressive in Germany's election than it was in the U.S. or France. Chancellor Angela Merkel remains favored — but the Kremlin still could leave its mark. 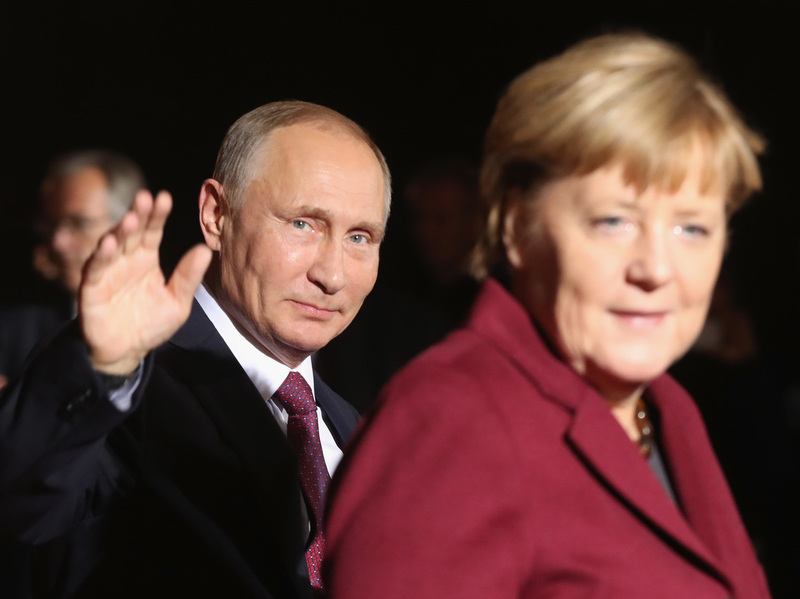 President Vladimir Putin's Russia appears to have meddled less in the German elections, in which Chancellor Angela Merkel is expected to retain power, than in other countries' recently. When he decided to run for a seat in Germany's parliament, Fricke says he knew that after the elections in the U.S., the Netherlands and France, the next big target for Russian election interference could be his own national election. "No one in Germany, if you ask the question, 'Do you think that Russia is trying to intervene with the German election in a certain way?' would say no," said Fricke, who also served in the legislature from 2002 to 2013. "The only question is how are they going to do it." Strangely and to the surprise of democracy watchers everywhere, the answer has been: lightly. There is evidence that Russian intelligence officers have been up to some of their now-familiar tricks in Germany — including cyberattacks, spreading disinformation and other strategies — but nothing has happened on the scale of other elections elsewhere, German politicians and other experts say. "We have problems with wrong information and right-wing propaganda, but all of them are coming from inside the country," said Alexander Sängerlaub, who leads a program called Measuring Fake News at the think tank Stiftung Neue Verantwortung in Berlin. It's more difficult for an influence campaign to cause the same kinds of issues with German voters as with Americans, Sängerlaub and others said — for example, the blame being placed in Washington, D.C., on the role Facebook played in 2016. "Social media isn't so important for the people in Germany for getting information about politics ... And we have a strong media system — people trust the media and there is not so much craving for alternative media," Sängerlaub said. Still, many observers expected interference in Germany to be bad. Constanze Stelzenmüller, the Robert Bosch senior fellow at the Brookings Institute, testified before Congress in June about Russian influence in Germany. It hasn't hit the same level of intensity as it has in other places. The Alliance for Securing Democracy, a bipartisan initiative housed at The German Marshall Fund of the United States, recently started tracking a list of 600 influential propaganda accounts on Twitter to see how they are propelling pro-Russia angles in Germany. The tracker shows an uptick in digital activity since the start of September, but the number of tweets pales in comparison to what was seen in America. The tracker's peak day this month saw 20,012 tweets total, whereas a single fake news story could garner thousands of tweets in just minutes in the summer of 2016, according to testimony given to the Senate Intelligence Committee earlier this year. Stelzenmüller pointed to laws in Germany prompted by the Holocaust that strictly prohibit hate speech. A new law that goes into effect in October will fine social networks if they don't take down hate speech within 24 hours of a complaint. "That's not to say there's nothing going on," says Stelzenmüller. "There appears to be a spike in social media traffic directed at Russian-German voters, which are estimated at 3 to 5 million." An examination of the kind of things the accounts are tweeting about, and who they're targeting, suggests one potential Russian strategy. German voters cast ballots for parties as well as their leaders. One new party in contention in this year's election is the right-wing Alternative for Germany, or AfD, which has polled between 8 percent and 15 percent since last year, when German Chancellor Angela Merkel's acceptance of hundreds of thousands of refugees fueled the party's staunch anti-immigration rhetoric. The party was formed just four years ago and in that time has shifted from a right-leaning populist party to a one that flaunts xenophobia and features a politician who condemned a Holocaust Memorial in Berlin. The party is also unabashedly pro-Russia. If Merkel wins, as now projected, and her Christian Democratic Union party repeats its current coalition with the center-left Social Democrats, the AfD could become the largest "opposition party" in the German government. That is a consolation prize, compared with the possibility of defeating Merkel. But in view of her strengths, the Russian influence machine may have chosen a different strategy. The Alliance for Securing Democracy's propaganda tracker consistently finds "AfD" as the most-used phrase by the Russian bots it tracks. "[Germany] is much less polarized than it was in the U.S.," said Stefan Meister, who heads the Robert Bosch Center at the German Council on Foreign Relations in Berlin. "So I think they understand — the Russian side understands — that their impact will be limited anyway. So that's why they focus on the right-wing populists, who are the main interrupter here in the political system, just to make them as strong as possible." 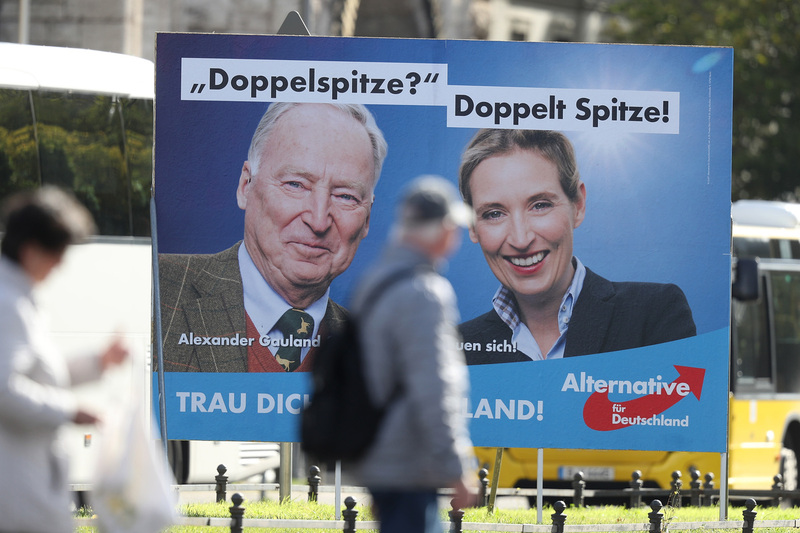 Alexander Gauland and Alice Weidel are the top candidates of the right wing and pro-Russia political party Alternative for Germany. The party is projected to win seats in the lower house of parliament. Finishing third in a U.S. presidential election would mean having next to no impact on the national stage after an election, but that is not the case in Germany. If current polls hold, the AfD could end up with more than 80 members in the 699-member lower house of parliament, the Bundestag, according to projections by the political research institute Infratest Dimap. "It would poison the climate in the German Bundestag," said Meister. "It would have a huge impact on the quality of the discussions in the German public, in German political circles, in the Bundestag. They would be much more polarized: much more homophobic, much more anti-migrant, much more-anti-Muslim." Any story about the Kremlin's international strategy needs at least one key disclaimer: Beyond supporting specific politicians, Russian President Vladimir Putin simply hopes to break democracies into shambles — especially in Europe. "[Russia] may not be aimed at strengthening one party or another, or ensuring that one or another person is elected to run the government — but that the trust in the functioning of our democracy is damaged," said Hans-Georg Maassen, the head of Germany's domestic intelligence agency. He spoke at an ominous press conference in July warning about impending Russian efforts. Some experts point to Russia and Germany's economic ties as a reason Putin's government is playing a smaller role than it has in other countries' recent elections. Others note that Germany still uses a paper-and-pen voting system that makes the country less vulnerable to digital compromise. But it's also important to remember the all-out blitz America saw in 2016, actually began years before. So the big digital push could still be coming ahead of voting on Sunday, says Measuring Fake News' Sängerlaub. "America is always a little bit faster than Europe ... So maybe what we're seeing right now, is what was happening four years ago in the American election campaign," he said. "It could be that in four years, when more people are using social media as their most important source of information, then we could deal maybe with the same problems." Merkel isn't expected to seek a fifth term in 2021, and as long as Putin feels vulnerable, European countries should expect the Russian government to look for ways to poke and prod weak spots in their electorates, says Jakub Janda, the head of the Prague-based Kremlin Watch Program at the pro-democracy European Values think tank. Putin worries that strong democracies near the Russian border could lead to Russians questioning their own authoritarian regime, Janda says. So the Russian leader doesn't want democratic countries to be successful models. He wants them to be in chaos. "Russia is very weak on so many levels: The only issues it is a superpower in is nuclear weapons, abortions, or doping," Janda said. "So if you are playing soccer, and you cannot defeat the other team because they are so much stronger, you can tear down the field so that it's hard to play." Reporter Simon Schütz, an Arthur F. Burns Fellow, contributed to this report.